From a human perspective the Fhrey are gods. They appear to be immortal, they are unbeatable in battle, and they utilize magic no human can hope to match. All these notions are shattered like glass when a rock flies through it in the form of a human blade that kills a Fhrey. That blade was wielded by a young human man named Raithe. Raithe is now known as something else, the God Killer. The Fhrey not appreciating one of their own being killed by a filthy stinking rhune, retaliate by destroying two human villages and everyone in them. The Fhrey while never seeming so vulnerable, have never been so dangerous. What will happen to mankind when the Fhrey come to exterminate them? Age of Myth was a really enjoyable book, but it was a slow start for me. Likely because I never read any of Michael J. Sullivan's Riyria stories other than a short story. Age of Myth and it's sequels are supposed to prequels of the Riyria series, but I can attest that no prior knowledge is necessary to enjoy this. The story started out slowly as one unfortunate event led to another, but it came together as the story continued. I saw more than a few familiar elements of other stories I enjoy in Age of Myth, but overall it was done in a way that was definitely enjoyable. The rulers of the world in Age of Myth are the Fhrey. A Fhrey is blessed naturally with long life, so long in fact they appear to never age to humans. A normal Fhrey has proven to be far beyond a man's ability to fight, but there are even stronger Fhrey known as the Miralyith that use a magic called the Art to wield the forces of nature. Many of the Miralyith actually believe they are gods because of the seemingly unstoppable power they wield. The Fhrey seemed quite similar to Tolkien's elves from The Lord of the Rings. The Miralyith reminded me of mix the privileged from the Powder Mage series and elves. Utilizing the elements from the with their hands along with incredible arrogance are the two main qualities Privileged and Miralyith shared. The story boasted some strong characters such as Raithe, Malcolm, Persephone, and Suri. They each played pivotal roles in the tale as it went on, but I'd like to focus on Suri. Suri was raised by a mystic that lived near the dahl, the ancient Tura. Because of this Suri doesn't understand much of the people of the dahl's ways. She thinks they are crazy to live in homes made of dead wood rather than in the forest with living trees that make great neighbors. She also believes when people say obvious things that they are playing a silly game. She immediately responds by saying something obvious as well. I'm not doing it justice, but it's clear that the clever young Suri thinks everyone from the dahl is a little bit off. Age of Myth was a pleasant surprise. I will absolutely be looking forward to the next book in the series and I will have to find some time to read the Riyria series to better appreciate what's going on. The fate of mutantkind is once again in peril. The release of the terrigen cloud when Attilan fell has had unexpected consequences on mutants. The terrigen makes mutants sick with a disease called M-Pox. 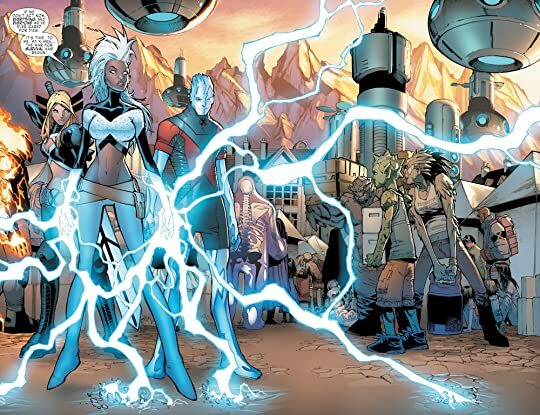 Storm has relocated the Jean Grey in order to protect as many mutants as possible from the cloud and the disease. As always the X-Men can't simply hide themselves when something sinister is afoot. I have to say my immediate thought when I heard the storyline for X-Haven was Marvel Studios was flexing their muscles with the Inhumans while casually threatening Fox that they can exterminate all the mutants from the comics. I can't say that there weren't moments that confirmed that thought, but I have to admit they did a good job with the story. 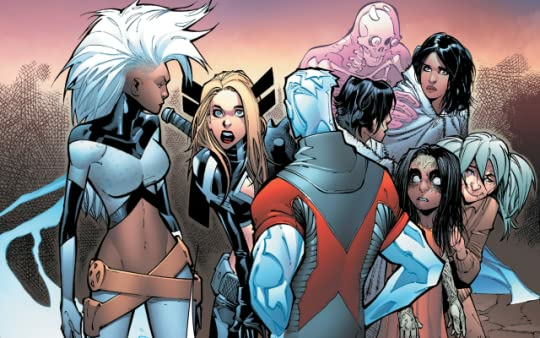 An interesting group of X-Men were chosen with Storm as their leader and things get wilder as the story progresses. While the disease and mutant extinction storylines are far from unique the world has changed due to Inhuman interference. They are mentioned everywhere and even when rampaging characters display crazy powers the question is now Inhuman or mutant. Thanks to the M-Pox mutants still are the more hated group though. Which seems unbelievable since the Inhumans were the cause of the terrigen cloud. X-Haven was a good story and I look forward to where the Extraordinary X-Men head next.